Kick off your visit on the 20th (Mon): enjoy the sand and surf at Nai Thon Beach, then make a splash at Splash Jungle Waterpark, and then enjoy the sand and surf at Mai Khao Beach. 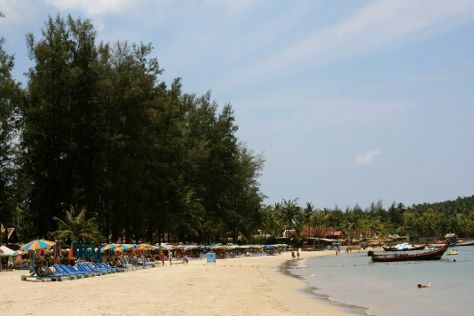 Get ready for a full day of sightseeing on the next day: tour the pleasant surroundings at Nai Yang Beach, look for all kinds of wild species at Gibbon Rehabilitation Project, and then enjoy the sand and surf at Bang Tao Beach. To find traveler tips, where to stay, maps, and tourist information, you can read our Nai Yang custom trip planner. Newcastle upon Tyne, UK to Nai Yang is an approximately 26-hour flight. The time zone changes from Greenwich Mean Time to Indochina Time, which is usually a 7 hour difference. Traveling from Newcastle upon Tyne in November, expect Nai Yang to be warmer, temps between 37°C and 27°C. Finish your sightseeing early on the 22nd (Wed) to allow enough time to travel to Karon. On the 22nd (Wed), enjoy the sand and surf at Patong Beach, then kick back and relax at Karon Beach, and then enjoy the sand and surf at Kata Beach. To see where to stay, other places to visit, and other tourist information, refer to the Karon trip builder. Traveling by car from Nai Yang to Karon takes 1.5 hours. In November, daily temperatures in Karon can reach 37°C, while at night they dip to 27°C. Finish your sightseeing early on the 22nd (Wed) so you can travel back home.